According to the U.S. Fish & Wildlife Service, up to 1 billion birds may be killed annually by colliding with windows. By knowing how to minimize these collisions, birders can protect birds without losing the benefits of windows from which to watch their favorite feathered visitors. Despite having exceptional sight, birds have a difficult time seeing glass. Instead, they see the reflection of the sky and plants in the glass. This looks like a safe area to fly, particularly if the birds are startled or threatened. Even at night, when reflections are minimal, lighted windows can be disorienting to migratory birds, causing them to collide with skyscrapers, office buildings, and other illuminated windows or glass walls. Large picture windows and corner windows are the most dangerous, but even small windows can lead to potentially fatal collisions. While a strong window collision can kill a bird on impact, many times birds are stunned and appear to recover and fly away. Unfortunately, these injured birds may later suffer internal hemorrhaging and brain swelling that leads to death. Stunned birds may also be less agile fliers and more disoriented, making them vulnerable to predators or additional collisions. To prevent these incidents, birders can take many easy steps both inside and outside to make their windows more visible and avoidable. It can be quick and easy to install collision-prevention measures on the inside of dangerous windows. Each of these methods will help birds better see the glass so they can avoid flying into it. Install interior blinds or shutters and keep them partially closed to minimize reflections. Angled appropriately, these can still provide plenty of light, adequate privacy, and a modified view while being safer for the birds. Remove houseplants near windows so birds will not consider them to be shelter or food. Instead, position plants and flowers where they cannot be easily seen from outside. Using a sheer curtain to create filtered sunlight will also help hide plants from birds' view. Install frosted or etched windows with less reflective surface area. 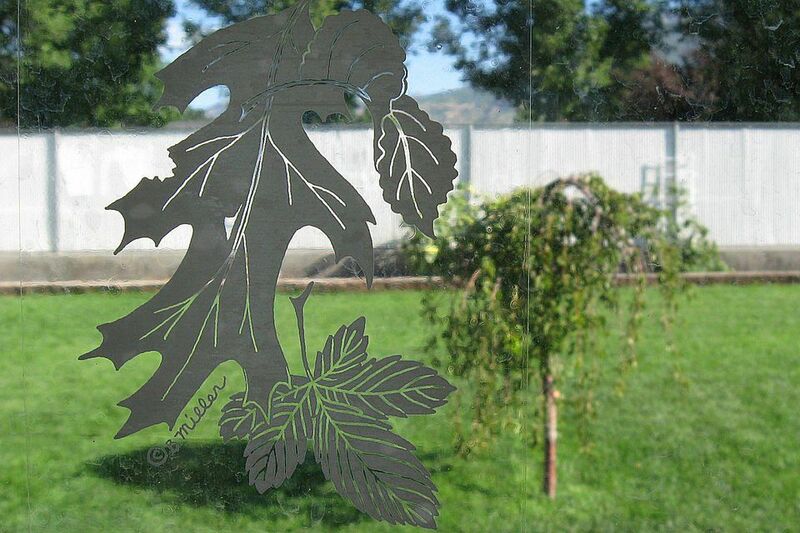 This can be done with new windows, or glass etching kits are available at craft stores and are ideal to use on windows. Easy-to-install cling film can also be applied to glass to create a frosted effect. Minimize nighttime illumination by using shades or shutters, or turn lights off when not needed. Similarly, avoid putting candles or other decorative lights in windows. Hang sheer curtains over large windows to minimize reflections. Kept closed, these curtains can effectively reduce window collisions without significantly decreasing light and visibility. Go outside and check all windows for “visual tunnels” that birds may believe they can fly through. Close doors or add curtains where appropriate to eliminate these tunnels. Be sure to check at different times of day when the sun's angle changes and reflections may vary. In addition to interior methods, there are several useful ways to help birds avoid window collisions from the outside. Break up a window’s reflection by adding decals, sun catchers, crystals, Mylar strips, windsocks, or other obstacles outside. If these objects sway in the wind, they will provide an additional deterrent. Note, however, that birds will attempt to fly through any space larger than 3-4 inches, so decals and strips must be close together over the entire surface area to be effective. Add one-way transparent film to large windows. This film can be seen through from the inside, but will appear as an opaque surface from the outside. Avoid mirrored film, however, which would reflect nearby plants and can confuse and disorient birds, and could even cause birds to attack the glass. Add taut screens to window exteriors or glass patio doors. Not only will screens break up the reflection, but if birds do collide with the screen it will cushion the blow and significantly reduce the chance of a fatal injury. Add external shutters to dangerous windows and keep them closed whenever possible to eliminate reflections. Storm shutters are another option. Add awnings over patio doors and large windows to prevent sunlight reflections. This will also help cool the window and increase your home’s energy efficiency, lowering utility bills. Place thick planter boxes with flowers and shrubbery at the base of dangerous windows. This will encourage birds to land in the plants for shelter rather than seek escape through the glass. Dead branches can also be positioned over the glass without obstructing the view. Allow windows to remain slightly dirty to cut down on the strength of the reflection. Choose window designs with lattices, wood strips, or other patterns in the framing or glass that can help deter birds. French doors and sliding doors can have removable lattices if desired. If replacing windows, consider having them angled down to reflect the ground rather than the sky and landscaping. Depending on the window design, however, this construction technique may void a window’s warranty or may not be possible with the home's structure. Keep bird baths and feeders closer than three feet to the window or further than 15 feet away. If the birds are very close to the window, they will not build up sufficient speed for an injury if they fly at the window. If they are further away they will be more easily able to avoid hitting the window altogether. Hawk Decals: Using 1-2 hawk silhouette decals does not discourage birds from hitting windows because of the decal shape. The shape of the decal is largely irrelevant to its effectiveness: using many hawk decals with appropriate spacing can work, however, by creating a visual obstacle birds can't fly around. Owl Figurines: Plastic or wooden owl figurines mounted on a pole or roof close to a dangerous window may be initially effective at keeping birds away. The implied threat will soon wear off, however, as birds learn that the decoy does not move or behave like a bird of prey. To minimize the risk of bird window collisions as much as possible, use several internal and external techniques at the same time. While one tactic may reduce the number of birds injured after colliding with windows, several tactics used at once will have the greatest results for preventing these unnecessary injuries and fatalities altogether.